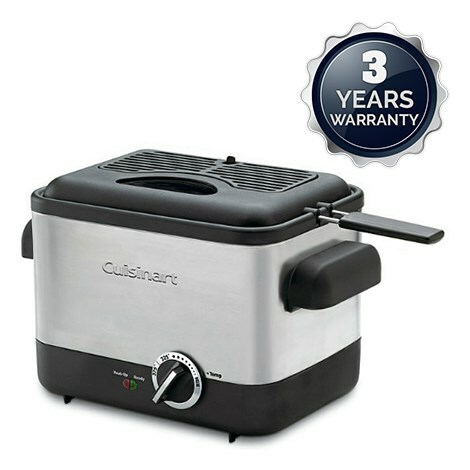 The Cuisinart CDF-100 compact deep fryer is compact and efficient appliance which fries three quarter pounds in just 1.1 ltrs of oil. It is ideal for making fried calamari, mozzarella sticks etc. Temperatures up to 375°F and a die-cast frying bowl maintain selected oil temperatures for optimum results. The 1.16quart Deep Fryer has many exciting features for users of all types. You can extend the lifetime of your 1.16quart Deep Fryer with the purchase of a FactoryOutletStore Factory Protection Plan. 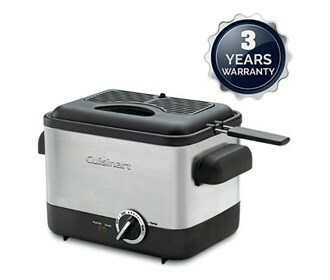 See the 1.16quart Deep Fryer gallery images above for more product views. The 1.16quart Deep Fryer is sold as a Brand New Unopened Item.